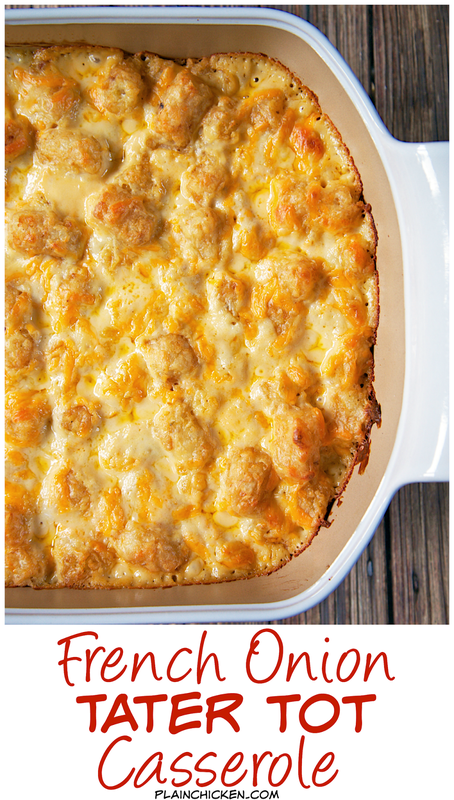 French Onion Tater Tot Casserole Recipe - tater tots, french onion dip, cream of chicken soup, cheese - LOVE this casserole! Can make ahead and freezer for later. You can even split it between two foil pans - one for now and one for the freezer. Super easy side dish with only 4 ingredients that tastes great! Potato Casseroles are my favorite side dishes. They are easy to make, taste delicious and are wonderful freezer dishes! 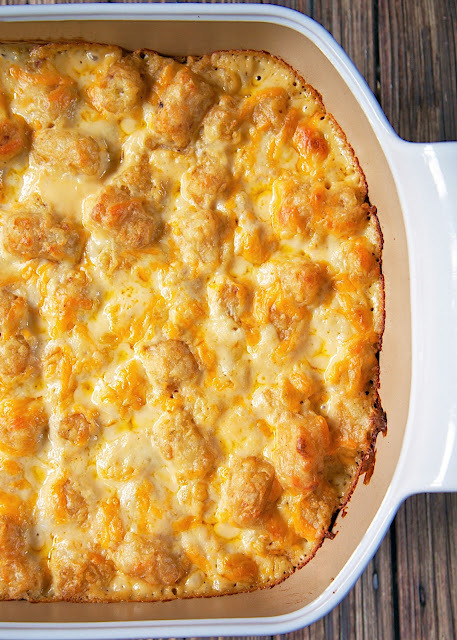 This French Onion Tater Tot Casserole is not different. Instead of using shredded hash browns, I used a bag of tater tots. 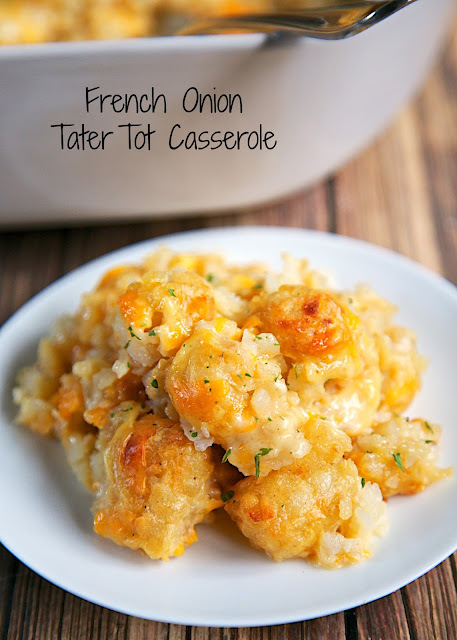 I love tater tots and they are super delicious in this French Onion Tater Tot Casserole. 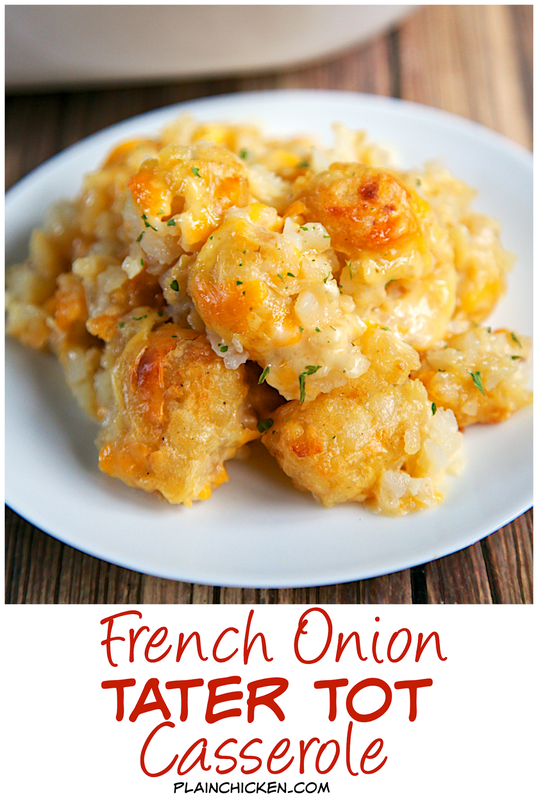 The French Onion part of this casserole comes from you favorite French Onion dip. I prefer Kraft French Onion dip, but any refrigerated French Onion dip will work great. I loved the flavors in this casserole. I could have made a meal out of it! We like to serve it with chicken, steaks, pork tenderloin and burgers. It really goes with everything. Make this ASAP! In a large bowl, combine potatoes, soup, dip and cheddar cheese. Pour into prepared pan. Bake for 45 - 60 minutes, until bubbly. I have a huge question. It might sound stupid but here goes. Do I add water to soup before combining with rest of ingredients? Tater tots and frozen hash browns are a great convenience and this sounds like a delicious use for the tots. There is no way for this to be anything other than fantastic. So easy too, I have to do this for a tailgate. Can I use cream of mushroom soup instead of chicken? People post dishes, I put them on the try sometime list and now have over 1000 so I decided to get the stuff and make this one tonight to go with some brisket. We loved it and Bev said this may be our new go-to potato recipe. Now we're thinking of things we can add to change it up a bit. Thanks for posting. Tried it last night, it was an awesome side dish! Yum! Do you thaw out the tots before you add them in, or just throw them in frozen? I just threw them in frozen. Do I need to cover the casserole when it bakes? I did not cover the casserole when I baked it. If I wanted to freeze it would I freeze it baked or unbaked? I always make onion dip with lipton onion soup mix and sour cream. I wonder if it would be the same? LOVE TOTS of ANY KIND!!! I think I'll try this with the MINI Tots!!! Could I put shredded chicken in it? Yes, or ground beef/turkey/sausage, or bacon I make a similar casserole for my family. I love using cream of cheese soup. Mmmmmm, cheesy tator tots. This sounds good, how do you think it would be with bacon bits and french fried onions? Anyway to convert this to a crockpot dish? Im a truck driver so no oven but do you think I can pull it off in the slow cooker? Absolutely. Mix it up as directed and cook on LOW for a few hours. Probably about 4 hours tops. Enjoy! Thank you for this recipe Stephanie! It was delicious. I had a whole rotisserie chicken in my fridge so I incorporated it into the casserole and it was great for a dinner entree with a veggie side. I just made mine with some shredded chicken I cooked in the crockpot and put in the freezer. 45 minutes to go. I'm waiting!!!! Hurry up and cook!!!. Can I assemble it the day before and bake it the next day ? Yes - you can even freeze it and thaw before baking. About how long can it be in the freezer? Would you take it out of the refrigerator when thawed and let it sit about 30 mins? To come to room temperature and cook it according to the directions. It would be great if you can let it get to room temperature before baking. If not, just add a few minutes to the baking time. I think it will keep a couple of months frozen. I keep pans of it in our freezer for a couple of months and it is always fine. Thanks Stephanie, I always like information for me because I live by myself and most recipe make to much for a single person and if I pass it onto someone else for information that person. Happy you responded so quickly. Most, times when I leave a comment I do not get a reply. There are only two of us, so I freeze all our potato casseroles for later too. Enjoy! Thank you for a great recipe. My whole family enjoyed it. The only change I made was using a can of Cream of Onion soup instead of Cream of Chicken. Thank you again! Thank you for a great recipe. My whole family enjoyed it. The only change I made was using a can of Cream of Onion soup instead of chicken. Thank you again. Hi what can I use instead of the canned soup? Or could I omit it? Thanks! I have never made this without the soup. So unfortunately, without further recipe testing, I cannot answer with certainty. As always, please use your best judgment regarding substitutions and modifications.